We specialize in the application of non-slip, long lasting treatment, which when applied causes a chemical reaction that leaves the surface of hard mineral existing floors and porcelain/enamel bathtubs with a higher friction level and no visible changes. Our product has been developed and proven for concrete, quarry tile, Spanish tile, ceramic tile, glazed brick, marble, terrazzo, porcelain/enamel, and many other hard mineral surfaces. 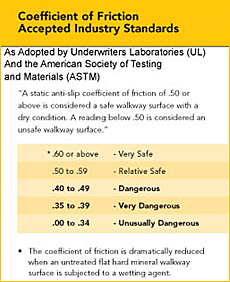 The end result is an increase in coefficient of friction up to 400% when subjected to water.